We are all products of our society, it would seem, from the moment we are born our gender is generally stereotyped into who we become. For most, there is nothing wrong with that; we grow up, we play games, we fall in love and get married. But what if, deep down in our inner being, there is something pulling at you, something nagging away that makes you feel that you're not what society wants you to be. Perhaps you're a boy who wants to play with dolls, a girl who'd rather play football than netball; you want to fit in but you can't because of society's rules. What if you don't fit into any of the labels which are expected of your gender? What then? Do we accept it and miserably follow a path that leads to a life we don't want for ourself or do we stand up and say, "This is me, my identity is my choice, this is who I am."? 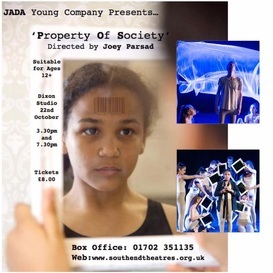 JADA Young Company have devised a piece of physical theatre which looks at gender through the eyes of one child and follows her battle into adulthood. 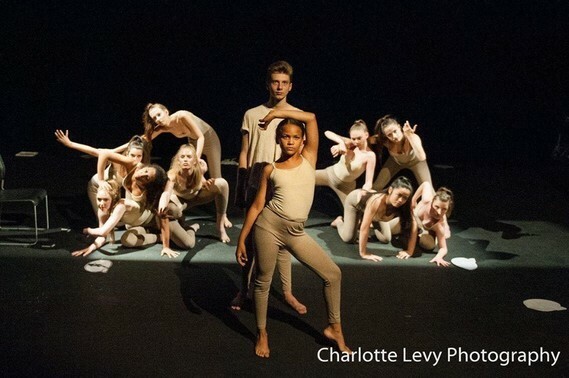 All of the participants of this dance and movement orientated piece show thorough commitment, not only to the topic but also to the physical interpretation which has been cleverly choreographed and flows effortlessly between the various musical accompaniment. Property of Society is just 30 minutes long but it takes you on a journey of awareness, with moments that have clarity and other times that can be left to your own interpretation. It has a lovely fluidity to it, yet with a pace that leaves the audience time to think. Ella Tekere gives a wonderful performance from one so young, full of expression and endearment and Elliot Stavrinou, Francesa Okonto and Danny Whitelaw bring their experience to the piece with their committed performances. I would be a liar if I told you that I understood everything this performance interpreted, and director, Joey Parsad, would I'm sure not expect it of audiences either; such is the joy of interpretive dance. What I can tell you, is that I felt the performance and especially the way its powerful conclusion make me feel. I'm also not ashamed to say that I shed a tear. There is one more performance at The Dixon Studio this evening. Try and catch it. Otherwise, I do hope that the company will have the opportunity to perform it again. As one audience member suggested afterwards, it would be an ideal piece to take to schools. Let's hope they have the chance to spread this very important message to all walks of society.